Hi guys!! Are you back home yet? I hope you had a good journey! The Sferisterio was built in the early part of the Nineteenth century, the stadium hosted ancient Italian sports, circuses and sometimes bullfights. It was funded by a few wealthy residents of Macerata and designed by a local architect. The stadium sits at the bottom of the city near one of the access ‘ports’ which lead to the centre high above. It consists of a huge arena (previously a playing field), a series of rooms, a supporting wall, boxes, and balconies. The design not only allows the building to blend with the local landscape but its structure ensures visibility for all and amazing acoustics without the need for modern amplification. As time has progressed the stadium has seen a number of more modern activities, including football, tennis and the occasional theatrical performance. It was first used for opera in 1914, which became very popular. For many years now, an annual Opera Festival has been produced at an international level and is a well-respected event. The stadium can hold up to 3000 people. The writer Paolo Volponi used to say that the wines of the Marche region were similar to the local people: changing from valley to valley, with their own distinct characteristics. The many characteristics and dialects of the Marche people are highlighted by the morphological structure of the territory, with its valleys from Emilia-Romagna to those of Abruzzo that descend parallel towards the sea. There is just one exception. The valley comprising Monte San Vicino in the east, the Monti del Catria in the west, the Sibillini in the south with Matelica in the centre: the Valle Camerte, an area producing a unique and versatile wine defined by Marco Soldati as sharp, rustic and refined – the Verdicchio of Matelica. Described as a full flavored white wine which naturally accompanies fish dishes, it is also ideal with many of the delicious local Maceratese specialties, including rabbit or chicken seasoned with rosemary, roast suckling pig seasoned with wild fennel and even with specialties found at the pork-butcher, ciauscolo in primis. Bacon chops and shoulder cuts of pork are added to considerable amount of fats in order to keep them tender; seasoned with salt, pepper, fennel, garlic and vino cotto, they are then finely chopped and minced so as to obtain a homogeneous texture to stuff it into the intestines which are used as containers. Next, the ciauscolo is smoked and then kept in a cool and airy place to complete its short curing process. Along with this exquisite spreadable salami, there are other ways to enjoy pork; starting with the brawn – the salami is eaten as a starter. Following the slaughtering and salting, the real centerpieces are produced from the pork offal – mazzafegato or salsiccia matta. The distinct, pure flavors of the interior areas of Macerata province have similarities and differences with other regions of the Apennines. They also share similar customs including the old tradition of herding. Lamb has always had a privileged place in both menus in restaurants and in home cooking. In the region of the Parco Nazionale dei Monti Sibillini, such as Monte San Martino and Visso, dairies offering handmade produce have also maintained their importance. Remaining on the theme of meat, we mustn’t overlook the work of protection and development carried out over the past years in defense of the cattle breed of the Marche region, which led to a certification method of filleting (whereby on acquiring a cut of meat, it is possible to trace clearly the origins of the productive cycle), which opened the way to similar procedures being adapted in other regions of Italy. A record in food terms, such as those of organic agriculture and regulatory procedures carried out in order to protect the production of handmade foodstuff from ratification: it is nice to think that in some way, there is a connection between the record achieved and the average age of population, thereby indicating a hope for the future. These are signs of high quality life that we also want to associate with the record number of wine consumers, completely unrelated to habits of alcohol abuse. With regard to wine: another treasure of the Maceratese wine industry is Vernaccia of Serrapetrona. Produced in a small hilly area, at the foot of a mountain, it is a red wine with both dry and sweet varieties perfect as an accompaniment to traditional desserts, such as pannociato, aniseed biscuits and nougat from Camerino. Regarding aniseed, the mistral, found in Loro Piceno, along with vino cotto, is one of the symbolic flavors of the entire province and is a reminder of a past rural civilization. The Bianco of Colli Maceratesi and the Rosso Piceno best accompany the rich local specialities of the Macerata province. From fried vegetables to polenta with vegetable to polenta with vegetable and meat sauces to baccalà (a type of preserved cod); from trout of Sefro to fish stews common along the coast and also the famous vincisgrassi. According to the original recipe, it was called ”pincisgrassi” after the codification of Antonio Nebbia, the famous Maceratese cook who had fundamental role in the second half of the 700‘s in the promotion of Italian gastronomy. Pure and refined flavors are found in the cooking, which is also rich in vegetables (from the herbs to the vegetables preserved in oil, or from the use of precious aromatic herbs to the mele-rosa, a typical locally grown apple), so as to emphasize the many wonderful extra virgin oils found in the region with qualities characteristics of the Cingoli area, the rolling hills around Macerata and the nearby coastal areas. The coastline offers both intense and delicate flavors thanks to the peculiarity of the local sea and where the local fishing traditions that have always inspired creative seafood recipes such as fish stews and many other traditional dishes, still popular today. If you need to enroll at the University and get general information. Office Hours: Monday to Friday 10.30 a.m./1 p.m. If you need to receive your residency permit/card (non-UE students). Office Hours: Mon-Tue-Wed-Fri: 9.00 a.m./11.00 a.m.
Office Hours: Monday to Friday 9.00 a.m./1.00 p.m.
For emergency/first aid, Guardia Medica (night service), specialist visits. Booking service Tel: 8000 98798 (land line number) and 199 419891 (mobile phone number). For the registration to the National health System. Office Hours: Monday to Friday 8.00 a.m./1.00 p.m. – 3.00 p.m./6.00 p.m.
2) in news agents or in the so-called “Tabaccherie” (Tobacconists). You can recognize them by their sign. 9-month Travel Card: € 176.40. There are many lovely towns to visit around Macerata, such as Tolentino, Abbadia di Fiastra, Recanati, Cingoli, or San Severino. If you wish to go to the seaside the nearest beach is in Civitanova Marche (30 minutes away), while if you like skiing the closest winter ski resorts are Sassotetto (Sarnano) and Ussita. You can also go by train. You can find schedules and prices at the website www.trenitalia.it. The ASUR n.9 (Azienda Sanitaria Unica Regionale) is the regional health authority supplying the standard medical assistance financed by public funds. Some treatments are free, others require your financial contribution (“ticket”). If you pay, please keep all the receipts, in the case you can ask for a reimbursement in your home country. – you need a medicine that pharmacies are allowed to sell only with a doctor’s prescription (called “ricetta”), such as antibiotics, anti-inflammatory medications, etc. – you need a prescription (called “impegnativa”) for specific treatments or checkup at Macerata’s hospital, such as a dermatologist’s visit, or a blood test. Family doctors are only available at office hours, generally between 8 a.m. and 6 p.m. from Monday to Friday. We suggest you to go to their clinics, or call and check their surgery hours (“orario di ambulatorio”) in advance. Here is a short list of Macerata’s family doctors. When you register with the Italian Health Care System, you are assigned to a specific family doctor, whom you will refer to, for the whole length of your stay in Macerata. If you need medical advice out of office hours (that is after 8 p.m. or during the week end) you can refer to the doctor on duty, also called “guardia medica”. You can either call him/her at: 0733 231378 or go directly to his/her clinic in Via Santa Lucia 2, very close to Macerata’s general hospital. In case of urgencies or if you need an ambulance, you can call the emergency medical service at 118 or go directly to the first aid station of Macerata’s general hospital. Tel: 199 419891 mobile phone number. The day of your checkup or treatment, you will be asked to present your family doctor’s prescription (“impegnativa”). If you want to access the Italian health care system and you are an extra-European student, you need a private health insurance policy against illness and accident. If during your stay you pay for treatments or examinations and keep all the receipts, you can ask your health insurance for a reimbursement in your home country. You will need the same insurance policy to apply for you temporary residence permit (“Permesso di soggiorno”). This code can be obtained for free at the “Agenzia delle Entrate” (District Tax Office) by simply presenting an identity card or passport. This does not require a great deal of time since the tax code is issued immediately, after filling in a specific form. Opening hours: Monday to Friday – 9.00 a.m./1.00 p.m.
Tuesday and Thursday – ore 3.00 p.m./5.00 p.m. Thanks to your health insurance policy against illness and accident, you can register for free to the Italian health care system and access to the medical services supplied by ASUR n.9. The registration is to be done at the head offices of ASUR n.9, also called “Distretto”. Where: ask for a building called “Distretto”, ground Floor, on the left. There are two university canteens in Macerata: one is in the historic town centre and the other in the Faculty of Education-Tourism. Both are run by ERSU (the Regional Agency for students’ services). You will need a rechargeable card (“tessera ricaricabile”) which you will use to enter the canteen and pay for your meal. … but not too much, I swear! Images are shamelessly taken from other websites. The first settlements in the area date back to the Iron Age. Before the Romans, the area had been colonized by the Picentes (Piceni) and the city was called Ricina. The name “Picentes” allegedly derives from the word picus, which means “woodpecker”. The Picentes, “those of the woodpecker”, are said to have been guided by a woodpecker on their way to Ascoli. For this reason, the symbol of the Region Marche is a stylized woodpecker. After the Romanization, Ricina was renamed to Helvia Ricina. Ruins of Helvia Ricina, destroyed by the Goths, have survived to these days and lie at Villa Potenza (a district of Macerata) just north of the town. After the destruction of Helvia Ricina by the barbarians, the inhabitants took shelter upon the hills, and eventually began to rebuild the city, first on the top of the hills then they descended again and expanded. The new rebuilt town was Macerata. After the Romans, the town has an on-again, off-again relationship to the Papal States up until about 1859. During the XIV century the Pope took portions of land from Fermo and Recanati and gave them to Macerata as a reward to its loyalty. Later the town kept changing hands: first it was transformed from free, independent Commune into Signoria under the Mulucci family, from the Muluccis to the Da Varanos to the Sforza family (1433). In the XV century Macerata flourished thanks to its strategic alliances: for example, when the Sforza family was defeated by a joint effort of the Papal State, the Duchy of Milan and Kingdom of Neaples, the administration pulled a political turncoat to get in the graces of the Pope and the town was rewarded with an upgrade to political and bureaucratic center. The XVI century was a golden age for Macerata, as the town flourished despite the frequent incursions and pestilences. First of all, the Pope authorized the official institution of the University of Macerata (though the law faculty dates back to 1290). The street layout was updated and improved, the walls were completed and many private mansions were built, such as Palazzo Ciccolini and Palazzo dei Diamanti. Other public works include the Loggia dei Mercanti and Palazzo dello Studio (the townhall, which was later revised by Salvatore Innocenti in the XIX century). As all glory is short-lived, Macerata entered a steady decline in XVII century, when the Pope decided to concentrate the administration of the territories in Rome. Business and trade declined as the political interest in the town faded, and public and private constructions dropped. Only religious architecture remained active, thanks to the institution of several religious orders that required the construction of monasteries, churches, etc. The Age of Enlightenment brought a sense of unrest in town: the lack of interest of the Papal State in the situation of Macerata led to bitter recriminations against the government. As the economical crisis raged on, the nobility of Macerata, frustrated by their exclusion from politics, invested in their public image, by building sumptuous mansions like Palazzo Buonaccorsi (1727), Palazzo Asclepi-Salimbeni (1725), Palazzo Torre (1738-1785), Palazzo Costa (1756) and many others. Notable religious buildings are Chiesa di San Filippo, the redesign of the Basilica Santa Maria della Misericordia by Luigi Vanvitelli, the construction of the Chiesa di S. Croce and the restoration of the Dome by Morelli, who later designed also the Lauro Rossi Theatre. The century ended with the occupation by the Napoleonic Army of the whole Papal State: the annexation to the Roman Republic stirred hopes of freedom and justice in Macerata, quickly wiped out by abuses of power and tax raises. At first repulsed by the resolute resistance of the town, the Napoleonic Army opened a breach in the walls after extensive gun firing. The subsequent looting, fires and killings caused 360 casualties. The XIX century begins with political instability, after a first restoration of the Papal Government, then more messing around by the French, then back to the Papal State. No wonder the seeds of the Risorgimento blossomed early in Macerata, the first rebel movements dating back to 1817: they culminated with a peaceful occupation of the city by its own citizens in 1831. But then, guess what? The movement crumbled and the city went back to the Papal State! The story repeats all over again a few times, until 1861, when Italy was founded and it proved fatal for Macerata, who lost three faculties and the Court of Appeals to Ancona, along with its army headquarters and some of its territories. More in general, a big town in a small state became a medium sized town in a very big country. Along with its political relevance, Macerata lost some of its original bastions and doors for the sake of transport and progress. Among the public works we can list the restoration of the townhall by Salvatore Innocenzi and of course the magnificent Sferisterio. Macerata is an important cultural center, thanks to its University and to the several historical buildings you can find in the city centre. 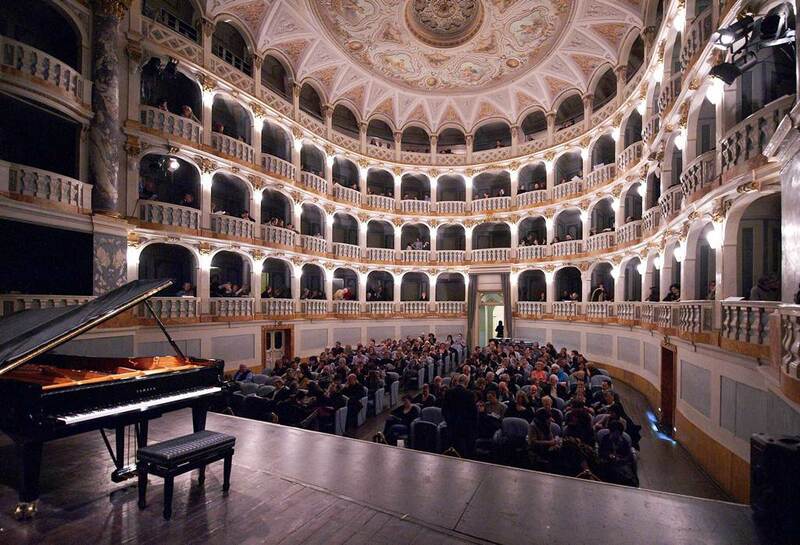 But that’s not all: Macerata has also different opportunities to enjoy your university life! The parties start on Tuesday, when all students go to Maracuja for a beer and to meet their friends. Maracuja is one of the most popular bars in Macerata. It’s a meeting point where to start the night.On Wednesday it’s a must to go to Tartaruga, a small disco where to spend some time having fun. And finally… Thursday night!! It means the “official” student night in Macerata: starting from 10 pm, you can find all the students on the streets and in the main bars of the town. Bar Centrale and Caffè Venanzetti are the busiest bars, where you’re likely to meet also some Erasmus students or foreign students who want to taste a bit of Italian-style partying. For these students, an association called “ESN Macerasmus” organizes also events and meetings to share experiences from all over the world. Starting from Friday night, at the weekends young people decide to taste a beer in one of the pubs located in Macerata: “Altrimenti ci arrabbiamo”, “Saint Julian’s Pub”, “Le Quattro Porte” are just examples for that. Most of them, however, prefer to get to the coast, where the most stylish clubs are located. The top is in the summer: you can even find a number of clubs along the seaside, with cool beach parties and lots of fun! An event to remark is the European Day which is on 9th May.. For the whole week, each bar or pub in Macerata will offer a special “Aperitivo” ispired to a specific European country. It’s such a pity that you’ll be there just the week after! Erasmus is the EU’s flagship education and training program, which enables students to go abroad to study or for a company placement and supports cooperation actions between higher education institutions across Europe. Around 90% of European universities in 31 participating countries are currently involved in Erasmus and more than two million students have participated in study exchanges since the initial launch of the program in 1987. – To help students to adapt to the requirements of the EU wide labour market. The program has proved a catalyst for encouraging higher education institutions to modernize and become more international in outlook. By taking part in Erasmus, universities have become more open and accessible to the outside world, rethinking their courses, teaching methods and student support structures, in order to attract foreign students and establish new partnerships with institutions abroad.